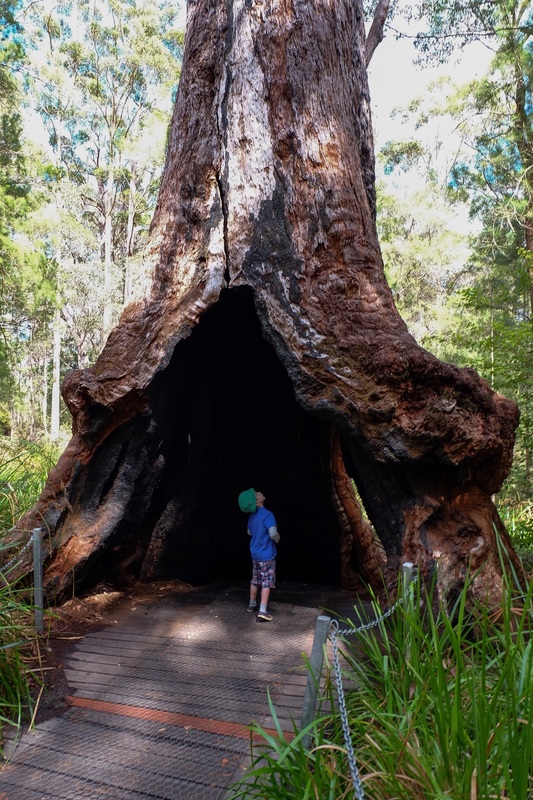 After a week of sightseeing and lazy beach life in Perth, on Monday we piled into a rented minivan with my sister, brother-in-law, and 3-year-old nephew, and headed south to see some of Western Australia’s forests. Our first stop was the Tingle tree forest and our cabin at Redmond’s Riverside Retreat, where Don and Margo Redmond took wonderful care of us on their sprawling and gorgeous property. On our first day, we walked down to the river and out onto the Redmond’s small jetty to watch the sun set over the river and look for small jumping fish in the water. We also saw a small heron, hanging out on a tree that was partially submerged in the water. The sun created beautiful yellow, orange, peach and golds in the sky as it disappeared behind the trees, and Rowan and his cousin couldn’t get enough of flinging rocks and sticks into the water to try to get the fish to jump. On day two, we started out bright and early for our treetop walk. Just a five-minute drive from the Redmond’s is the entrance to the Tingle forest, with mature trees reaching between 60 and 75 metres high. 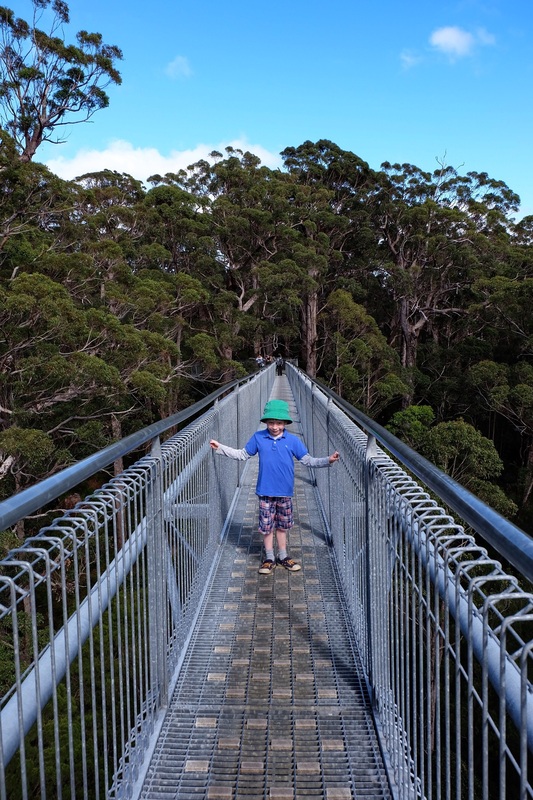 The Conservation area has a quasi-suspension metal ramp that led us 40 meters above the ground into the forest canopy. It was spectacular. We loved looking out at the super tall trees, seeing how green and lush they are, and how their branches reach out so eagerly for the sky. Forty metres seems impossibly high until you’re up in the air, walking across a slightly shaking bridge, looking out over the foliage and underbrush below. Looking down can be unnerving, except for fearless Rowan, who practically lept across the bridges. The air was clean and fragrant and wonderful. It smelled like flowers and leaves, soil and grass, clean water and air. After spending an hour wandering around the treetops, the ramp led us down to the ground, where we followed curving paths strewn with fern leaves to some of the most long-lived Tingles, some as much as 400 years old. The forest is very shady and quiet, but you can hear all sorts of birds, frogs, lizards and insects. We got to stand inside a few of the giant Tingles’ hollowed out trunks and look for small bats that tend to roost there, but sadly, we did’t find any. After an hour walking around the trunks of the giant trees, craning our necks to look at how tall they are, we headed into the town of Denmark, for some lunch. 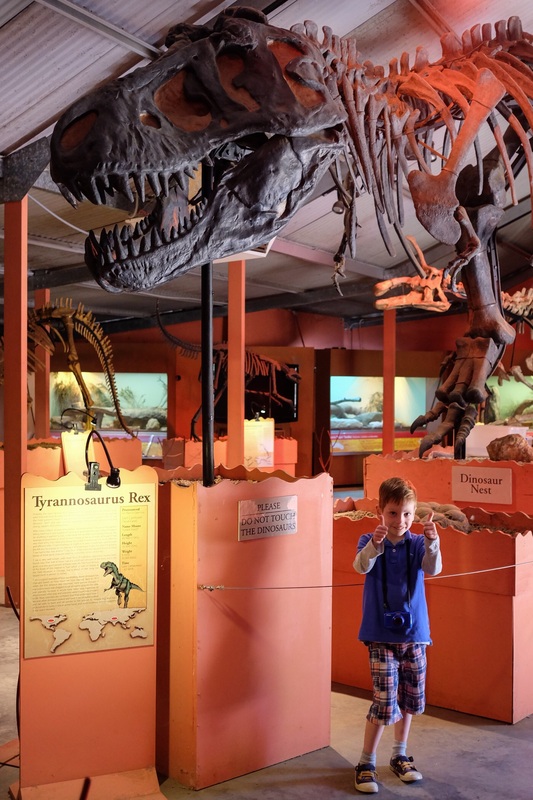 Then, while his cousin napped back at our cottage, Kevin, Rowan and I drove a few km to Denmark Dinosaur World. It’s a private collection of replica dinosaur fossils, on display as you would find in any dinosaur museum, including a T-Rex, Velociraptor and a Tuojiangosaurus, a relative of Stegosaurus. The site also has about a dozen different lizards and snakes, and Rowan and I got to hold a baby monitor lizard, a baby Python, and a full grown Python. 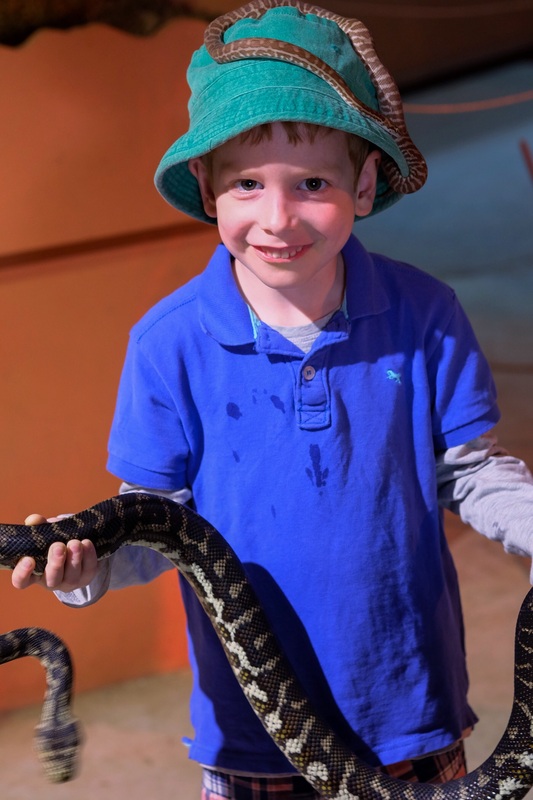 The adult Python was super cool – it wound itself around my arms and wrists and slithered up through my sunglasses, which were hanging off the front collar of my t-shirt, and then up my neck. When we went outside, we visited about two dozen different exotic birds including black cockatoos, white cockatoos, and blue and gold macaws. My favourites were the three, pink-breasted white cockatoos, whose delicate colouring made them look something like ice creams with fancy head crests and wings. Rowan got to stand, gawking and smiling, as a little red parrot cluched his arm and I got to hold a red-tailed black cockatoo on my shoulder. 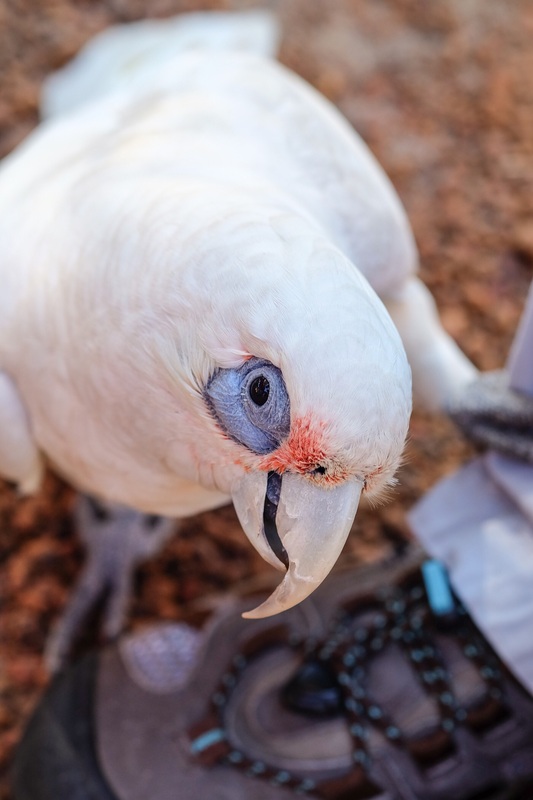 My favourite part was when it clucked gently in my ear, scraping the lower and upper parts of its beak together, which the owner of the park said meant the little guy was happy. 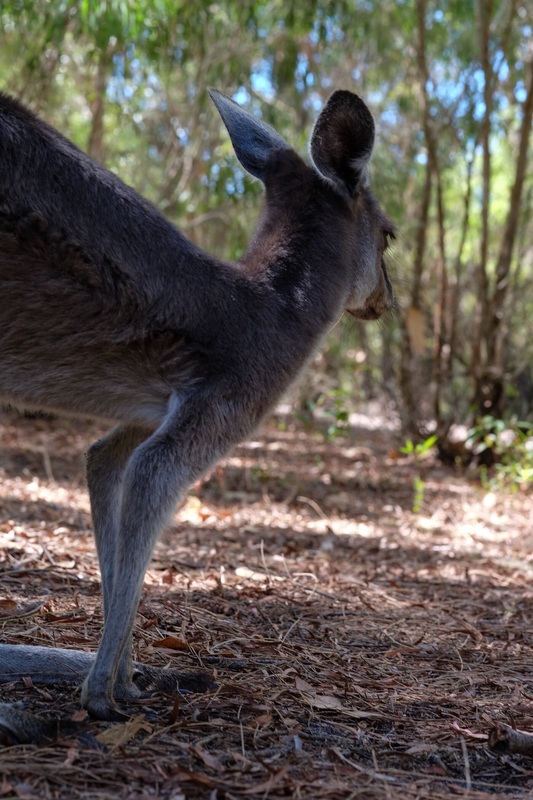 After we visited all the colourful and chatty birds on the property (one kept saying “Hi, Pricilla!”), we walked through a small gate into a fenced-in enclosure that contained two kangaroos, which Rowan was super happy to have the chance to follow around and pet. The male kangaroo was very lazy and seemed to enjoy lying in the sand and being hugged. The female, however, was more active and preferred running around among the trees and bushes – and Rowan had fun playing hide-and-seek with her. 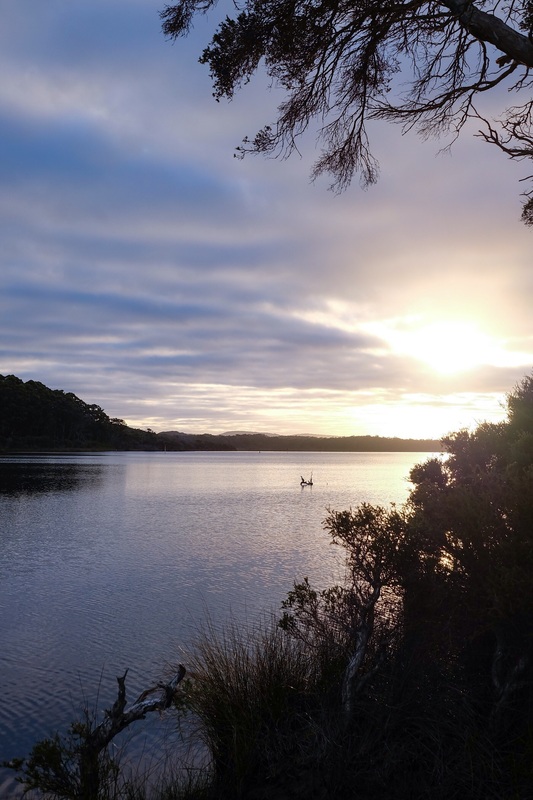 Then it was time fora small barbecue back at the cottage and a good night’s sleep before heading out on our next adventure: visiting spectacular limestone caves and Western Australia’s famous wine region, Margaret River. So many new things to do see and hold Rowan you must be having a great time the look on your face says it all.